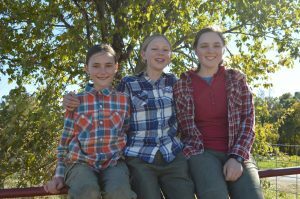 Broad Branch Farm is a family farm owned and operated by Brian and Anita Poeppel and 3 daughters – Lucy, Susannah and Laura. 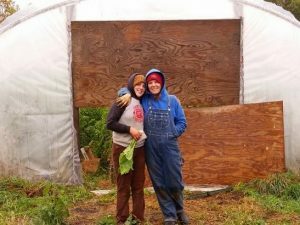 All 5 members contribute to the success of this diverse food producing farm no matter the age. We share many loves – growing food, raising animals, working outdoors, cooking, eating amazing food, taking care of our environment just to name a few! We are passionate believers that local organic food can bring wellness and joy to our lives and our communities. We believe in knowing where our food is grown, who grows it and what growing practices have been used. We want it local, produced organically, absolutely fresh and delicious. We firmly believe in supporting the agriculture you want to see dominating the landscape – does it hurt or does it help our environment? We follow these principles in all we do to produce food for our family and for our customers. No short cuts, no compromises. Back in 1995, Anita set up a card table full of herbs at the Naperville Farmers Market. The herbs expanded into salad greens and more vegetables. Eventually, Brian joined the effort by producing the first batch of pastured meat chickens and the rest is history. Broad Branch Farm became a popular stop at the market for organic vegetables, eggs and meat. Anita heads up the vegetable enterprise at BBF and contributes to the livestock when Brian needs help. She is committed to producing and eating local organic food. She is an advocate for pesticide drift awareness and is also a co-founder of the Spray Drift Education Network. Brian grew up in the Chicago suburb of Glen Ellyn, IL and was a city kid most of his life. The change to farming and rural life could have been a rough one but instead, Brian found a passion for producing local organic food. In 1993, Brian earned his BS at the University of Illinois in History and Political Science. He worked as a business consultant for a few years but the growing farm business needed his help. In 2001, Brian quit his office job for good and began farming full time with Anita. Brian tends the farm’s meat chickens, laying hens, pastured hogs and grass fed beef. His favorite enterprise is the grassfed beef and he loves the challenge of grass feeding and finishing the calves. He has gone from never touching a calf to grass feeding and finishing 10+ calves per season. Anyone who tries our beef will agree it is finished, tender and absolutely delicious – everything you might not expect from grassfed beef. 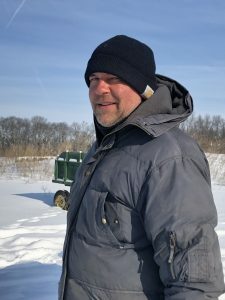 With tending the livestock, helping with the vegetables, maintaining equipment and raising 3 children, Brian tends to keep himself occupied most of the time. Lucy joined the family in December 2001 and has been a big part of the farm ever since her first farmers market at 5 months old. She is part of the regular garden crew and the team that puts together the vegetable boxes every week for 24 weeks. Lucy is a natural leader who provides direction and instruction to people twice her age. Her ability to clearly see the most efficient path to complete a job is invaluable as time is always limited. She is skilled in the garden, with the livestock and brainstorming how to improve and move the farm forward. 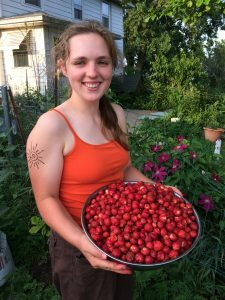 You will see her at our CSA deliveries handling the distribution and sales of our beautiful food. Lucy also heads up our annual spring plant sale when we offer our favorite Tomato and Pepper varieties. Speaking of food, she is also an adventurous talented cook creating anything from homemade ice cream from our Jersey cow milk to an amazing meal for the entire family – made from scratch with BBF food, of course. 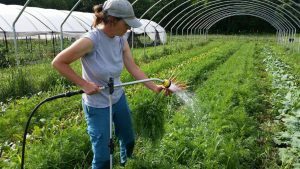 Susannah joined our family in February 2004 – our first growing season at the Wyoming farm. She also started her selling career early attending the farmer’s market with her family when just 3 months old. Susannah’s enterprise is Fresh Cut Flowers. 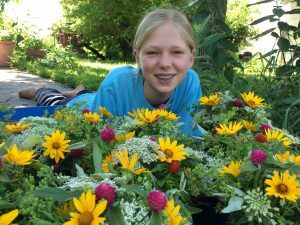 She is growing annual and perennial flowers and creating arrangements. The arrangements are old fashioned, cottage style mixed bouquets with fragrant flowers and herbs – always beautiful. Self taught, Susannah has a natural talent with her bouquets. 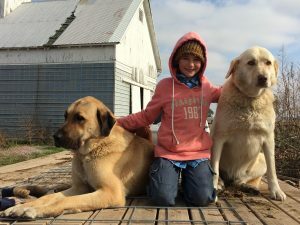 Susannah is a friend to all animals on the farm and is especially fond of our laying hens, dogs and kitties. With her gentle, friendly manner, the animals love her right back. 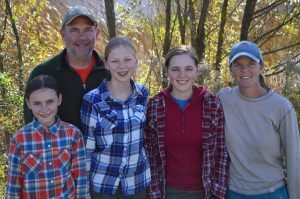 Our family welcomed Laura in February 2008 and she has fit right into our busy farming life. Her enterprise is Fresh Cut Herbs. 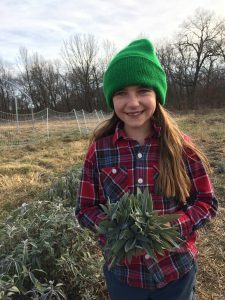 At just 10 years old, she is harvesting and marketing her fresh herbs through our Home Delivery and CSA program. She is meticulous about the quality of her fresh herbs and you will not find a fresher herb bundle for your cooking. She is motivated, determined and head strong – a true entrepreneur! She loves our big dogs, kitties, chickens, her horse Missy and just being outside enjoying the farm.